James Reid was a man with three careers. He was born near Dunkeld, Perthshire, Scotland, located in an area known as “Big Tree Country” to Gaelic speaking Presbyterian parents. When he was a young man he began to follow an evangelical Congregationalist missionary movement. Before being sent to Glengarry, Upper Canada, Reid received limited theological training followed by ordination in 1806. 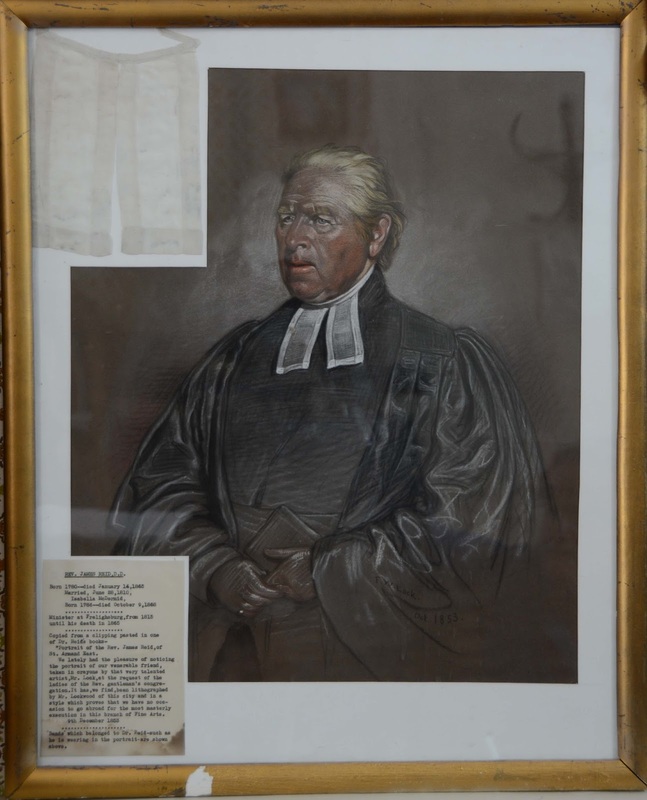 He found the area already well served by clergy and moved to Martintown, Upper Canada where he built a church and gathered a small congregation. Reid soon faced financial difficulties and took up teaching in Cornwall, married (1810) Isabella McDermid, 1786-1868, and the first of eight children was born. A meeting with a friend resulted in Reid being recommended to take a school in Frelighsburgh, Lower Canada (1812) where he came under the influence of the Rev. 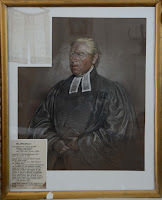 James Stewart of Holy Trinity Church. Rev. Stewart encouraged James Reid to consider the ministry of the Church of England. Reid was prepared for Anglican ordination (1816) by the Rev. C. C. Cotton, of Dunham and was appointed as Rev. 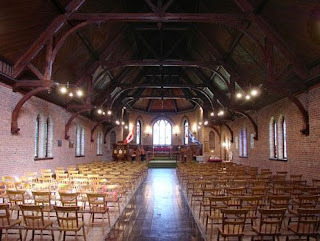 Stewart’s curate and two years later was given the appointment of Holy Trinity Church and the church at Philipsburg. Reid’s third career spanned fifty years. He died following a stroke two years before the birth of Canada. Rev. Reid’s ministry took place in the old church built by Rev. Stewart. The family lived in a drafty cold parsonage which Rev. Reid personally spent his own money to maintain. Clergy salaries were paid out of a fund which was slated to end and congregations were expected to financially support their clergy – a task which was completely foreign. The Reid family had a modest farm operation, held investments in stocks, and shopped wisely. Rev. Reid was an avid reader and writer. He subscribed to newspapers (both church and secular), read novels, published three books, and a host of articles, essays, comments to newspaper editors, letters to family members, fellow clergy, politicians, and sermons. He also wrote a journal in which he recorded daily events and his own thoughts about a wide range of topics. The journals numbered 36 and only four survived his death as he burned them thinking they were of no value. Reid’s writings show him as the chronicler of his age – an age of population influx into the Eastern Townships mainly from the U. S. A., a time of indifference to the church, religious rivalry from Methodists and Adventists, uncertainty for the survival of the Church of England, extreme weather conditions, alcohol and opium abuse, the War of 1812, the Rebellion of 1837, and a lack of respect for conservative values. The writings also portray Reid as a generous supporter of his family to whom he lent money and assisted with the gifts of farm animals. He kept in constant contact with his children: Charles Peter, 1811-1888, who was a Church of England minister at Sherbrooke; John Hugh, 1813-1864, who in 1863 joined the US Union Army as a wagon master and died in the prison at Andersonville, Georgia; 1817 infant daughter died; Isabella Christina, 1818-1819; John Malcolm, 1820-1850, who died at Copper’s Well, Mississippi; James Stewart, 1823-1866, who farmed at Brome; Jane, 1825-1901; and Nancy, 1828-1856. Rev. Reid was guaranteed a pension if he retired; however, his successor’s salary would be totally raised by the congregations. The fear of such a loss and burden kept Reid working until he died though he did have an assistant which helped the congregations in the transition of the minister’s stipend coming from missionary support to total local support. 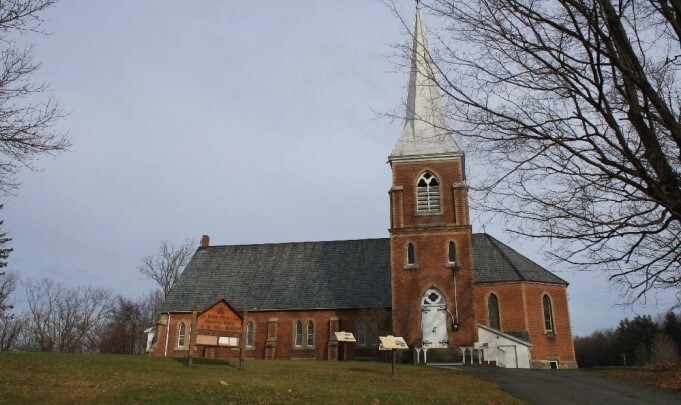 Philipsburg eventually acquired its own minister and Holy Trinity was expanded by two school house congregations. The wooden church building of Rev. Charles Stewart was removed in 1880 and replaced by the magnificent brick building that graces the Town of Frelighsburgh. Rev. and Mrs. Reid’s daughter, Jane, gave the church a gift to purchase chairs thus avoiding the practice of families paying an annual rent for a pew in order to attend worship. She wanted people of all means to be able to freely worship. Jane Reid knew intimately the financial worries of her father. The life span of the Rev. Dr. James Reid began with the American Revolution and ended just as Confederation was dawning. He witnessed the growing communities of the Eastern Townships and many world events: the abolition of Christianity in France, the abolition of slavery, the Battle of Waterloo, the Millerite prophecy, the Irish Potato Famine, the first postage stamp, the choice of Ottawa as a future capital city, Darwin’s Origin of Species, Abraham Lincoln, the American Civil War, and in 1864 thinking that his life was uneventful he burned 32 volumes of his diary. 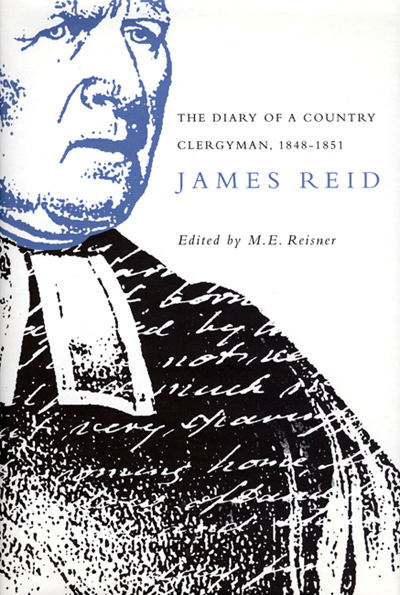 Reisner, M. E. The Diary of a Country Clergyman, 1848 – 1851 James Reid. Montreal & Kingston: McGill-Queen’s University Press, 2000.